Alaska has enjoyed a long and rich history with hydroelectric power. By 1908, southeast Alaska alone had over 30 developed water power sites with a capacity of 11,500 kW. The vast majority, built by private developers, provided power for industrial operations, mainly for the gold mining works in Juneau and on Douglas Island. Today hydropower in Alaska provides 24%1 of the statewide electrical power. Major developers include the State of Alaska and public and privately owned utilities. These power plants have proven to be long-term, reliable, and relatively inexpensive sources of power. Hydropower installations have the reputation for being robust and durable, operating successfully at some sites for more than a century. Hydropower’s low operation and maintenance costs coupled with long lifetimes result in stable power rates. In Alaska, hydropower is currently the largest and most important producer of electricity from a renewable energy source. With increased interest in replacing fossil-fuel-powered generation with renewable energy resources, the statewide inventory of installed hydropower capacity will continue to expand. Hydroelectric power uses the gravitational force of water falling falling or flowing water to generate electricity. 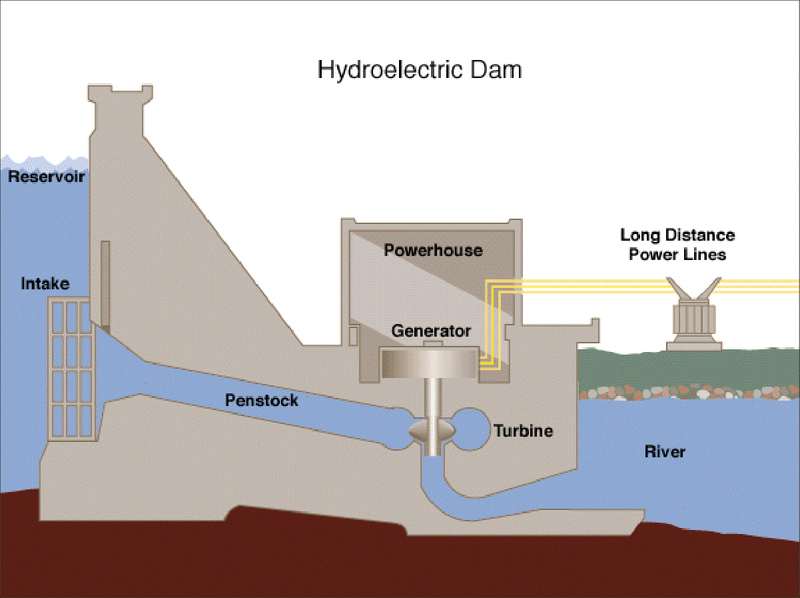 Most hydroelectric power comes through the use of dams: the potential energy of dammed water drives a water turbine and generator. The power that is generated at a hydroelectric facility depends upon the volume of water moving through the dam and the height difference between the water's source and outflow. Typical High-Wall Reservoir Hydroelectric Dam Structure. A list of the larger facilities serving utilities opens by clicking below. In Southcentral Alaska, the Eklutna hydroelectric facility was brought on line in 1955 by the federal government. In 1994 it was taken over by Anchorage Municipal Light & Power. As the cheapest energy source connected to the Railbelt energy grid, it currently produces power at a rate of a few cents per kWh. The Cooper Lake hydroelectric facility is owned and operated by Chugach Electric Association. It began operation in 1960 and was recently relicensed by the Federal Energy Regulatory Commission. 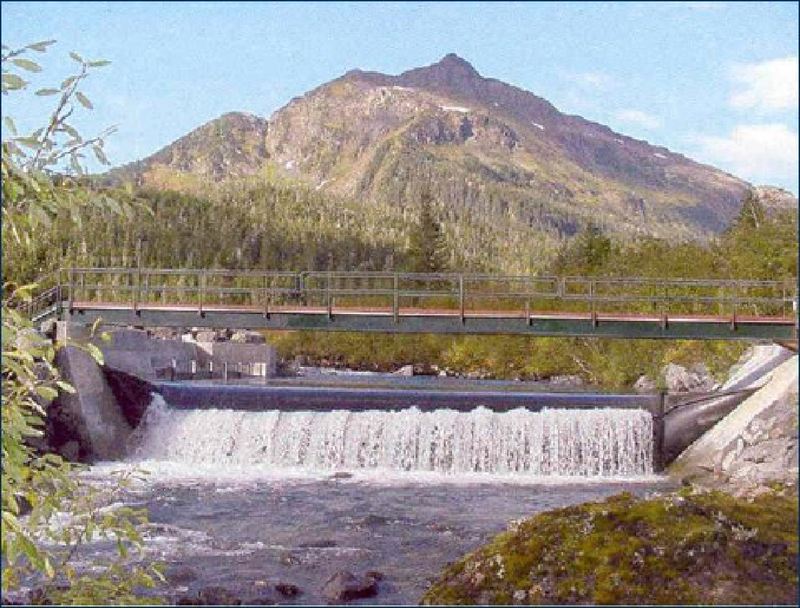 A number of smaller hydroelectric projects owned by individual utilities are located across the state, mostly in Southeast Alaska. There are also some very small private facilities, most of which are owned by fish processors. Hydroelectric power is the generation of electric power from the movement of water flowing from a higher to a lower elevation. In contrast, hydrokinetic technology is a pre-commercial technology that uses river current to generate electric power. A hydroelectric facility requires a dependable flow of water and a reasonable height of fall of water, called the head. 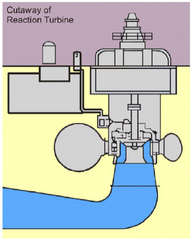 In a typical installation, water is fed from a reservoir through a conduit called a penstock into a hydraulic turbine. 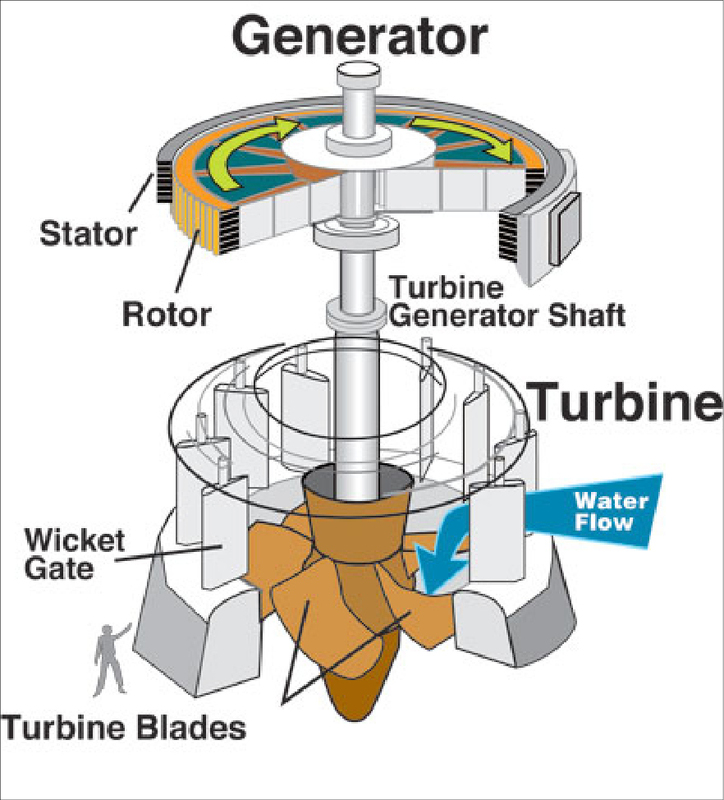 The pressure of the flowing water on the turbine blades causes the shaft to rotate. The rotating shaft is connected to an electrical generator, which converts the shaft motion into electrical energy. 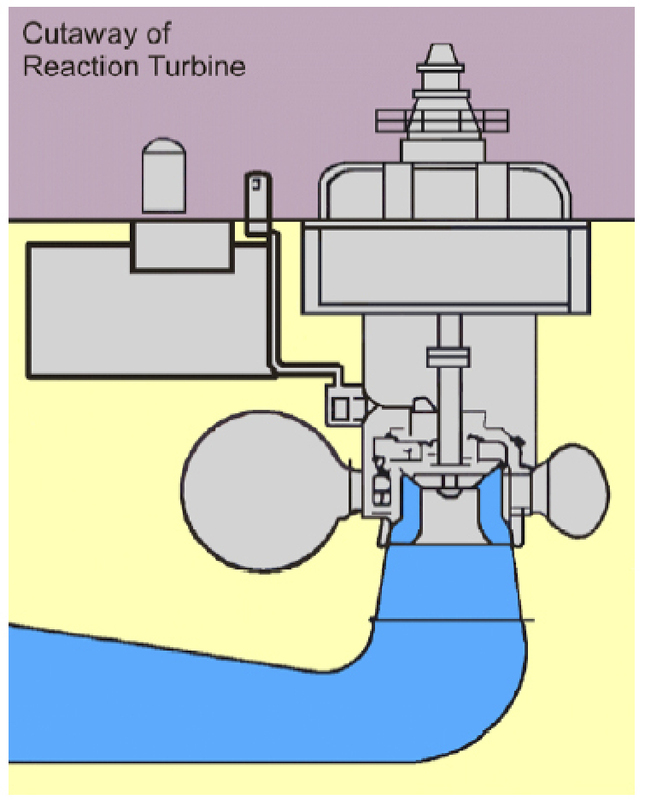 After exiting the turbine, water is discharged to the river in a tailrace. Before a hydroelectric power site is developed, engineers must assess how much power will be produced when the facility is complete. They also review the natural conditions that exist at each site: surface topography, geology, river flow, water quality, and annual rainfall and snowfall cycles. Extensive studies are conducted to evaluate the site’s environmental conditions, land status and other factors that may influence the configuration of the hydro plant and the equipment selection. A given amount of water falling a given distance will produce a certain amount of energy. The head and the discharge at the power site and the desired rotational speed of the generator determine the type of turbine to be used. The greater the head, the greater the potential energy to drive turbines. More head or faster flowing water means more power.4 The steep mountains, abundant rain and snow, and relatively mild winter temperatures in Southeast and Southcentral Alaska provide the ideal hydrologic conditions for hydroelectric power. Cross section of hydraulic turbine generator. A more complicated formula is used to refine the calculations of this available power. It takes into account losses in the amount of head due to friction in the penstock and variations due to efficiency levels of mechanical devices used to harness the power. To determine how much electrical power can be produced, the mechanical measure (horsepower) must be converted into electrical terms (Watts). One horsepower is equal to 746 watts (U.S. measure). 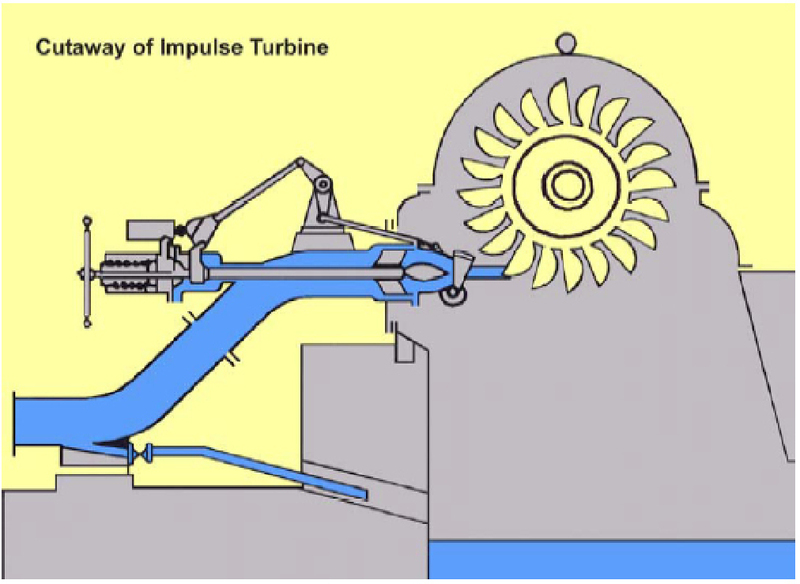 Impulse and reaction turbines are the two most commonly used types. Other types of turbines include fixed pitch propeller and crossflow (also called the Ossberger or Banki turbines). Each has a specific operating range in terms of hydraulic head and power output. In order to optimize the power output and reduce capital costs, the specific turbine to be used in a power plant is not selected until all operational studies and cost estimates are complete. The turbine selected depends largely on site conditions. A reaction turbine is a horizontal or vertical wheel that operates with the wheel completely submerged, a feature that reduces turbulence. In theory, the reaction turbine works like a rotating lawn sprinkler, where water at a central point is under pressure and escapes from the ends of the blades causing rotation. Francis or Kaplan turbines are reaction machines that utilize both hydraulic pressure and kinetic energy to create rotating shaft work. 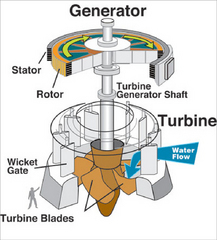 Reaction turbines are the type most widely used in Alaska. An impulse or Pelton-type turbine is a horizontal or vertical wheel that converts the fluid’s change in potential energy (hydraulic head) into kinetic energy by water striking its buckets or blades to make the extractable rotating shaft work. Pelton or Turgo impulse turbines may have single or multiple nozzles that accelerate flow to produce high velocity jets that impinge on a set of rotating turbine buckets to transfer their kinetic energy. The wheel is covered by a housing, and the buckets or blades are shaped so they turn the flow of water about 170 degrees inside the housing. In contrast to a reaction turbine, the fluid contained in the impulse turbine does not completely fill all available void space, and the turbine operates at ambient pressure. After turning the blades or buckets, the water falls to the bottom of the wheel housing and flows out. Source: Bureau of Reclamation, 2005. A low-head dam is one with a water drop of less than 65 feet and a generating capacity less than 15,000 kW. Large, high-head dams can produce more power at lower cost than low-head dams, but construction of large dams may be limited by lack of suitable sites, by environmental considerations, or by economic conditions. The key to the usefulness of low-head units is their lower capital costs and the ability to satisfy local power needs with the available resource. Source: Alaska Energy Authority, 2008. Run-of-the-river hydro facilities use the natural flow and elevation drop of a river to generate electricity. Facilities of this type are optimally built on rivers with a consistent and steady flow. Power stations on rivers with great seasonal fluctuations require a large reservoir in order to operate during the dry season. In contrast, run-of-the-river projects do not require a large impoundment of water. Instead, some of the water is diverted from a river and sent into a pipe called a penstock. The penstock feeds the water downhill to the power station’s turbines. Because of the difference in elevation, potential energy from the water upriver is transformed into kinetic energy and then to electrical energy. The water leaves the generating station and is returned to the river with minimal alteration of the existing flow or water levels. With proper design, natural habitats are preserved, reducing the environmental impact. Run-of-the-river power plants typically have a weir or diversion structure across the width of the river. This weir contains an intake structure, often consisting of a trash rack, an intake screen, and de-sanding elements to conduct the water into the penstock. These installations have a small reservoir behind the diversion to keep the intake flooded and reduce icing problems. The output of the power plant is highly dependent on the drainage basin hydrology. Spring breakup will create a lot of energy, while flow diminishment during winter and dry seasons will create relatively little energy. A run-of-the-river power plant has little or no capacity for energy storage, and so cannot coordinate the output of electricity generation to match consumer demand. Most run-of-the-river applications are small hydro. Small hydro is the development of hydroelectric power on a scale that serves a community or an industrial plant. The definition of a small hydro project varies, but a generating capacity of up to 10 MW is generally accepted as the upper limit of what is termed small hydro. Small hydro can be further subdivided into mini hydro, usually defined as less than 1,000 kW, and micro hydro, which is less than 100 kW. Micro hydro applications might serve for single families or small enterprises, while mini hydros might be appropriate for small communities. A small hydro plant might be connected to a conventional electrical distribution network as a supplemental source of renewable energy. Alternatively, a small hydro project might be built in an isolated area that would be uneconomic to serve from a network, or in areas where there is no electrical distribution network. Small hydro projects usually have minimal reservoirs and civil construction work, consequently a relatively low environmental impact. A large and growing number of companies offer standardized turbine generator packages in the approximate size range of 200 kW to 10 MW. These water-to-wire packages simplify the planning and development of the site, since one vendor looks after most of the equipment supply. Non-recurring engineering costs are minimized, and development cost is spread over multiple units, so the cost of such systems is improved. While synchronous generators capable of isolated plant operation are often used, small hydro plants connected to an electrical grid system can use economical induction generators to further reduce installation cost and to simplify control and operation. Micro hydro plants may use purpose-designed turbines or industrial centrifugal pumps connected in reverse to act as turbines. While these machines rarely have optimum hydraulic characteristics when operated as turbines, their low purchase cost makes them attractive for micro hydro class installations. Regulation of small hydro generating units may require water to be spilled at the diversion to maintain the downstream stream habitat. Spilling will also happen when the natural flow exceeds the hydroelectric system capacity, since the project will generally have no reservoir to store unused water. For micro hydro schemes feeding only a few loads, a resistor bank may be used to dissipate excess electrical energy as heat during periods of low demand. In a sense this energy is wasted, but the incremental fuel cost is negligible so economic loss is minor. Since small hydro projects may have minimal environmental and licensing procedures, the equipment is usually in serial production. Civil works construction is also limited. The small size of equipment also makes it easier to transport to remote areas. Fore these reasons, small hydro projects may reduce development time. Small hydro and mini hydro can be used as alternative energy sources in off-grid communities with small loads. Small hydro tends to depend on small water turbines fed directly by rivers and streams. When compared with other renewable energy alternatives like wind and solar, run-of-the river hydroelectric generators are able to deliver a relatively consistent electric supply throughout the day. Run-of-the-river hydroelectric generators in Alaska do not provide the same seasonally consistent electric supply that larger hydroelectric projects do. This is a result of the seasonal changes in the flows of Alaska rivers, with diminished flow rates during the winter months. The dams and reservoirs of larger hydroelectric projects provide for energy storage, holding water to be used to generate electricity when flows are lower. Unfortunately, most Alaska electric loads are highest during the winter, the same time that river flow (and the electric power generation capability of small and run-of the-river hydro) is at its lowest. This lowers the amount of run-of-the-river hydro capacity that can be installed without significant amounts of excess capacity in the summer. When suitable hydraulic heads are not present or when power needs are substantial, dams are constructed across rivers to store water and create hydraulic head to drive the turbo machinery. Dams typically last for 50 to 100 years and so, are constructed of durable materials like reinforced concrete, roller-compacted concrete, earth, and crushed rock. Smaller dams may be constructed of steel or timber crib design. They vary substantially in terms of height and storage volume, depending upon local topography. There are several design approaches used for concrete dams, including solid and hollow, gravity and arch geometries. In addition to the actual dam structure, there are a number of other major design considerations. For example, the penstock inlet manifold (usually with screens to keep debris and fish from entering the turbine) and the discharge or tailrace system must be designed to maintain the hydraulic head and minimize the effects of sedimentation, silt, and ice build-up. Substantial effort goes into the design of the dam spillway to safely direct extreme flows downstream of the dam when the available reservoir storage is inadequate to contain it. Where the topography allows, several successful design concepts are available to help mitigate the environmental impacts of conventional storage hydropower projects. In regions with high-elevation natural lakes, lake taps may be utilized to feed a power tunnel bored in rock to carry water to the downstream powerhouse. This approach reduces the need to construct a dam; the tunnel serves in place of the penstock; and the lake is utilized as a natural storage reservoir. 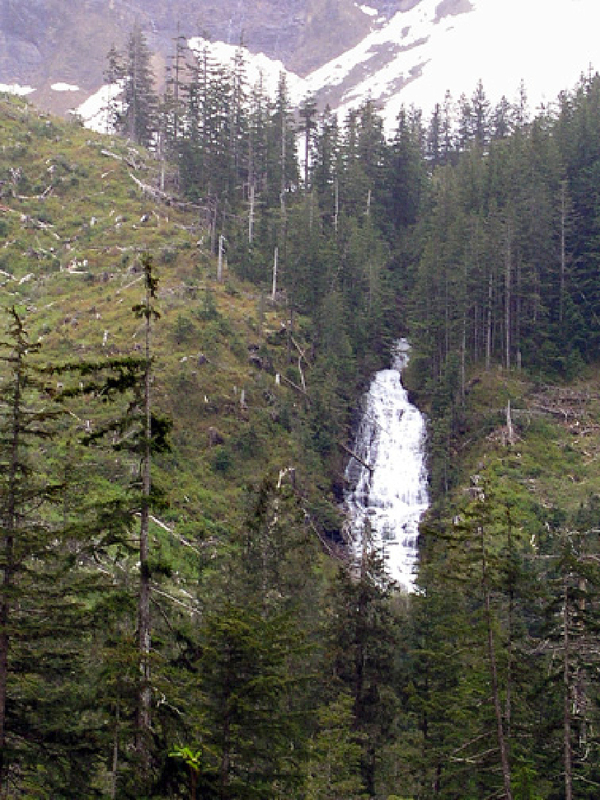 At other sites, natural barrier waterfalls can facilitate licensing of upstream hydro development through their function as fish migration barriers. Fish protection and passage facilities and eco-friendly turbines can also be designed to mitigate fisheries impacts of hydroelectric facility construction. In order to be constructible, all hydro projects must pass rigorous assessment. Environmental effects must be determined. Mitigation measures, compliance monitoring, and environmental follow-up programs must be established. A strong attribute of conventional hydropower is the dispatchability that results from the ability to control the rate of power production through storage and release of water contained behind the dam. Given the general increase in electrification that is occurring worldwide, the demand for using hydropower reservoirs for both base-load and peaking applications is rising. Other factors may also lead to increased interest in conventional hydropower. The variable nature of other renewable energy sources like wind and solar makes pairing with hydro energy storage an attractive option for integrated supply systems. Additionally, the scale of energy production attainable with hydroelectric storage lends it to connection with large electrical grids to displace conventional fossil fuel-based power sources with clean, non-carbon-based power. Fuel switching to inexpensive hydropower may be possible in some situations for home heating and (someday) for plugin hybrid cars. Alaska Energy Authority (AEA) has established a website about a new 600 MW hydroelectric project at Watana on the upper Susitna River: http://susitna-watanahydro.org/. From Petroleum News: "By feeding electrical power into the Alaska Railbelt power grid in sufficient quantity to meet around 50 percent of the Southcentral Alaska power demand, the state sees the Susitna-Watana hydropower system as a major contributor to achieving a statewide goal of obtaining 50 percent of power from renewable sources by 2025." 1. Renewable Energy Atlas of Alaska, Alaska Energy Authority, July 2007. P. 10. 2. Renewable Energy Alaska Project (REAP). "Hydroelectric Overview." 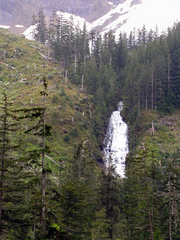 http://alaskarenewableenergy.org/alaskas-resources/types-renewable-energy/hydroelectric/. Accessed: 25 July 2011. 3. Regulatory Commission of Alaska. "Water Power Development." Web. Accessed: Aug. 23, 2011. http://rca.alaska.gov/RCAWeb/Programs/WaterPowerDevelopment.aspx. 4. U.S. Department of the Interior, Bureau of Reclamation, Power Resources Office, Hydroelectric Power, July 2005.